Ever since our huge order went in, we’ve been eagerly awaiting the Fleece Artist boxes – these are some of the nicest boxes to receive. Well… they’re here! 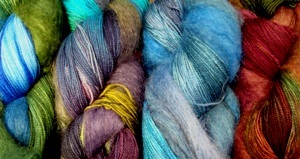 We’ve restocked our Merino with Angel Hair and Nyoni which are both still on sale. We have an assortment of colours which may not all be shown on the website, so please call or email us if you wish to place an order for these yarns. Sabine is a beautifully fitting shrug made from Goldiehair, a medley of lucious kid mohair, silk, and nylon brush. This garment fits like a glove and is so cozy for those cool fall days. One of our favourite, “go-to” kits is back! The Slubby Scarf with Super Kid Loop, and Slubby Blue is a super fast and fun project. I see a lot of people getting Slubby Scarves for Christmas this year! 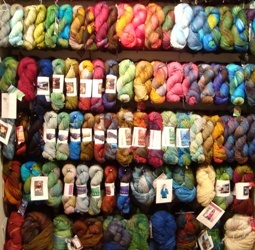 We also received single skeins of the slubby. Come by and see the hat Anina made from it – it’s too cute! 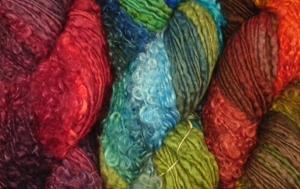 We’ve re-stocked our Soft Wavy Wraps… these can also be used for small throws on couches or chairs. I have one of the back of my couch which comes in handy on cold nights of knitting and watching tv! New colours that we’ve added this season include; boreal, aurora, labrador, and red fox. Labrador is especially lovely, with ever so rich blues and browns – a new store favourite! This entry was posted on Friday, October 9th, 2009 at 6:26 pm	and is filed under Uncategorized. You can follow any responses to this entry through the RSS 2.0 feed. Both comments and pings are currently closed.